Do you really need silicone? Just about every day we are educating and guiding our customers through the maze of selecting materials. As we discuss their application we are able to narrow down material choices from hundreds to just a couple. In some cases a more pricey elastomer may be specified when it is not necessary and on the other hand the application will require a high performance material. So when is silicone the best choice? One of the key elements of silicone is its ability to maintain its mechanical properties over a wide range of temperature, -80° F – 400° F (60° C – 205° C) and in some case even colder or hotter. Silicone is also naturally UV resistant which makes it ideal for outdoor applications. There are silicone foams that are UL94-V0 rated which is commonly required in the transit and electronic sectors. It also performs well in compression set tests as compared to some of the organic elastomers, such as neoprene. Silicone gaskets and silicone pads are available in open cell foams, closed cell sponges, various durometer solids, and can be readily molded in variety of colors. There are also high tear strength silicones, reinforced silicones, electrically conductive silicones, and thermally conductive silicones. It is important to know that silicone is more expensive than some of the organic materials, so it’s critical to understand the demands and performance required. For example, for shock or vibration isolation at room temperature, Poron® urethane foam performs excellently and is much less expensive, but if that same application is moved outdoors where there are temperature extremes, silicone foam or sponge would be required. 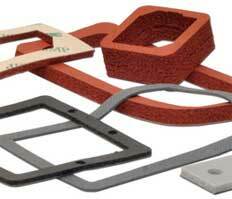 For applications assistance or more information about material selection for gaskets and pads, please call Stockwell Elastomerics at 215-335-3005 or complete a contact form for assistance.